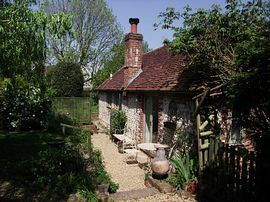 Delightful flint cottage situated on the edge of the Goodwood estate, in the grounds of the owners thatched cottage. Single storey, mainly open plan studio style accommodation. 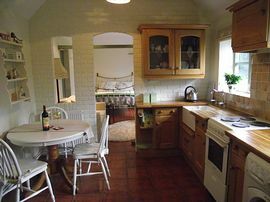 Consisting of kitchen-dining room, shower room and bed-sitting area housing a double bed, leather sofa, TV and fireplace. Patio doors lead out onto your own pretty patio and garden. Goodwood house is within walking distance, as is the Goodwood Park hotel, which offers a picturesque Pay and Play golf course plus restaurants, which are open to non hotel guests. Kitchen-dining area with electric oven and hob, microwave, fridge-freezer, washer-dryer and toaster.Dining table with seating for 3 people. 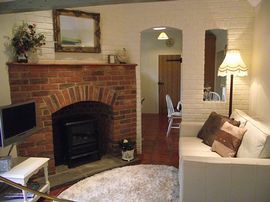 Bed-sitting area with double bed, wardrobe, leather sofa, flat screen TV-DVD and fireplace. Patio and garden area with bistro table and chairs plus BBQ. We supply complimentary welcome provisions. 2 miles away lies the historic walled city of Chichester, famous for its Norman cathedral and Roman connections. offers fabulous shopping, restaurants and of course the Chichester Festival Theatre, which attracts many of the worlds top actors to its stage. A 10 minute drive will take you to the charming town of Arundel, situated on the river Arun. With its impressive castle, numerous art, antique and tea shops plus boat trips. Arundel is the perfect day out for all ages. There are excellent sailing and watersports facilities, on the nearby coast at Bosham and Itchenor and the non-commercial sandy beach and sand dunes at West Wittering are beautiful. Within walking distance of the Goodwood estate. 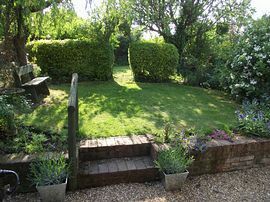 2 miles from Chichester City Centre. All bed linen and towels provided please provide own beach towels. Well behaved pets welcome but please be aware that we have 2 dogs, a cat and several chickens on the premises. Pets charged £20 per week. Private patio and garden adjorning owners property with patio table and chairs plus BBQ. Local Services: " miles to Chichester City centre, local bus service within 1/4 mile. Quarter of a mile off A27 taking A285 directions to Petworth. From Lavant first right after sign to Goodwood Park Hotel. Elm cottage is situated behind the thatched cottage (Flintstone cottage) on the right. See map. 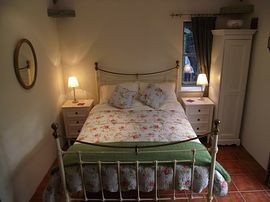 Weekly rate from: £295 - £450, inclusive of all bed linen, towels and welcome provisions.